I’ve been playing the tinwhistle since 1972. Started out learning Irish traditional music, but gradually absorbed other idioms as well. Finally got around to starting a blog about it. Which will be observations about playing the whistle and learning Irish music. Trying to organize thoughts on the inner essence of what mentally happens when I play the thing… and if you play the whistle, you well know things DO mentally happen. Will try not to be too intellectual or ethnomusicologically intense… (do you realize the amount of caloric energy expended in just spelling “ethnomusicologically”? … probably an extra day of your life depleted…) Can’t promise, though — like the scorpion said when he stung the frog carrying him across the raging river knowing they would both drown, “Sorry, dude, it’s just my nature.” [Stith-Thompson International Folklore Motif-Index K815.6]. Not going to give reviews on whistles or whistle players. Just wanted a space where I can spin out some thoughts I’ve been having the last number of years about this crazy little pipe and the music rolling around my head. Just stuff I think about the whistle that you might think about, too, if you play it. And, yes, feel free to respond and even send in your own thoughts on whistlery or Irish music. Probably will publish them if they’re interesting. What have we got to lose? This is the new landing place for www.lemccullough.com – the Irish music part of it, anyway. If you’re looking for L.E.’s playwriting activities and book sales go here: www.educationalclassroomplays.com … you’ll find his public policy/grantwriting/marketing etc. info at http://lawrencemccullough.blogspot.com. Not yet skilled in the techniques of psychic bi-location, I will that night be in Burlington, NJ at Third State Brewery sitting in with an amazing singer/songwriter from Australia, Brien McVernon. Which will be pretty darn fun, as well. But, I’m thrilled to know Trian is performing again, even if for a few shows. Their formation was a very exciting moment in the late 1980s’ Irish Traditional Music world; when I got a phone call from Liz Carroll in September, 1990 (how in the pre-internet days she tracked me down is a kind of wonder) asking if they could record my tune “Not Safe with a Razor” for their debut album on Flying Fish Records, I right away said, Absolutely Yes and Thank You. The album appeared the next year … “Not Safe with a Razor” was the final tune in the final medley — and they totally rocked it. Other musicians picked up the tune, and it’s been played and recorded here and there the last number of years … Lúnasa, Padraig Rynne, Noel Sweeney, Teyr, Jez Hellard Djukella Orchestra, Brian Finnegan, Cormac Breatnach & Deiseal, others. The Irish Times has dubbed it “flippant”; Paste declared it as “triumphant”. It appeared as incidental music in a 2002 National Public Radio segment titled Rev. Moon in Brazil. But it was Trian’s superb recording and stellar reputation that first sent it rippling out among large numbers of ears. Returning the favor, I eventually composed tunes commemorating each of the players: Liz Carroll’s Fancy, Billy McComiskey’s Reel, Sproule’s Rule. Liz Carroll’s own compositions are phenomenal, and if you’re very lucky, you’ll hear Trian do several. Not sure if Billy or Daithí compose, but probably they do. Ask them! If Trian is in your area (or if they aren’t, but you have mastered the Art of Bi-Location), stop at nothing to hear them live, starting here this Thursday in Chicago. They’re that good and likely even better than you can imagine. PEOPLE AROUND the world keep having birthdays … seems to be built in to the whole life-mechanism thing happening to all of us existing in this current dimension. For anyone celebrating their Earth Entrance Day, here’s an Irish Traditional Music tune in your honor — “The Birthday Jig” composed by master string player/dance caller Larry Edelman way-way-wayyyyy back in 1979 and released on the Devilish Merry album titled The Ghost of His Former Self (followed by “The Drumshambo Jig”). I played whistle on the track and feel entirely confident in stating that this is Appropriate Music for the 21st Century. 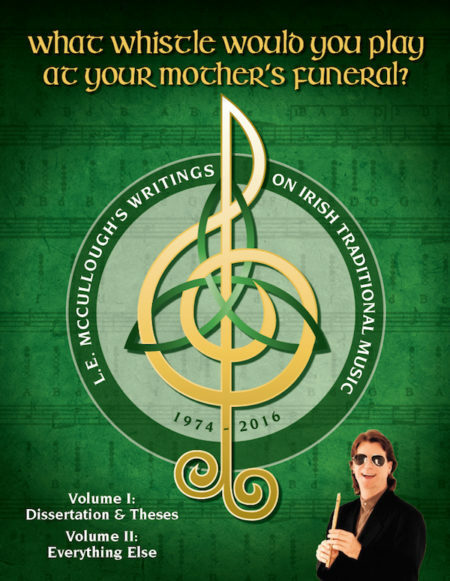 It’s time … decades of articles, papers, dissertation copies rescued from the nether regions of my dusty file cabinets … now the entire motherlode of Irish Music Knowledge can reside in one comfortable package at 1 Literary Place, Your Bookshelf. Kindly reprinted from New York Irish Arts.com. AS OF TODAY, July 2, 2016 Feb. 19, 2017 Mar. 18, 2017, Apr. 18, 2017, I have composed 175 190 195 original instrumental compositions in (or derived from) the idiom of Irish traditional music. 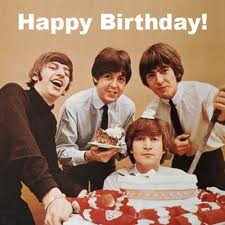 Here’s the latest: “Paul Keating’s Birthday”, a snappy double jig in G major. hardest-volunteering person in Show Business. And he calls a great céilí, too. If anyone deserves an extra tune part, it’s Paul Keating. It was concertina stalwart Doug Barr … just 4 days later, he had his fondest-ever birthday wish granted: a Personalized Commemorative Composition by L.E. McCullough. Would you like a commemorative tune of your own? Perhaps for a special friend or family member? For a small fee, immortality can be achieved! Email lemccullough@mac.com with pertinent details … Operators are standing by! Covering Any Notable Occasion including (but not limited to) birthday, wedding, wedding engagement, funeral tribute, Sweet 16, quinceañera, walkabout, ordination, graduation, enjoying a great meal, surviving rumspringa, reaching the unreachable star, getting a job, leaving a job, falling in and/or out of love, first body piercing, winning the Nobel Prize — and more! It will sound much better on her harp, certainly. And if the “marbling” term seems odd, well, welcome to Irish Traditional Music naming norms — and go here to see the Marbling Mystery Revealed! The Piper Pat Sky on youtube! Made a tune for him just now, “Gary Fortine” … a moderately slow Slow Air – works as a sort of pegleg strathspey, too. I’ve got rocks in my bed, and I just can’t lay down there no more, no more. Old rockin’ chair’s got me, and the blues is knockin’ on my door. TODAY, 18th of September, is the day marking the celebratory entrance into this Temporal Planetary Dimension of New Jersey ceoltóir Pete Ford … in other words, it’s his birthday. Here’s a tune to jam on — “The Birthday Jig” composed by master string player/dance caller Larry Edelman way-way-wayyyyy back in 1979 and released on the Devilish Merry LP The Ghost of His Former Self (followed by “The Drumshambo Jig”). SCIENTISTS have calculated the odds of each of us being born at the exact moment and time we were born … to the unique pair of parents to whom we were born … with the precise DNA structure that we and only we possess … as 1 in 400 trillion. In round zero-type numbers, the odds of us actually being us is 1 in 400,000,000,000,000. I’m not a mathematician, but I believe that represents far more than a bazillian. So, for all of us in the 1-in-400 Trillion Club, let’s take time out today to make or hear or think some music. Here’s a new tune for shutting off the lights … or celebrating the Winter Solstice. Depends on whether you’re a Glass Half-full or Glass Half-empty type of person … (or a Glass Half-full but with a Leak in the Bottom). New York actor/comedian Booth Daniels has sagely pointed out that — if the Mayan calendar has 260 days in a year — the End of the World has already in fact come and gone … and humanity clearly isn’t as important as we think we are, since nobody bothered to send us the memo through proper channels. Anyhow, enjoy the tune and see you on the Other Side of Wherever.